The Bentson Copple reSource is an all-in-one informational source that provides and analyzes real data from real practices to present the most accurate information available within the orthodontic industry. Each issue of the Bentson Copple reSource includes articles written by the most distinguished consultants, industry insiders, and business leaders within the world of orthodontics. From marketing advice to financial insights, the Bentson Copple reSource focuses on the topics that are important to today's orthodontists, their practices, and their future endeavors. The Bentson Copple reSource is solely business-oriented and does not include clinical information. It is the only quarterly newsletter written exclusively for orthodontists. 1-Year Subscription to the Bentson Copple reSource (15% savings off cover price). Marketing Advice from well-known and trusted consultants within the orthodontic industry. Real, Timely Data extracted from real orthodontic practices, allowing you to gauge your practice. Financial and Legal Insights to provide practical guidance for your orthodontic practice. Tips and Tricks to manage and operate your practice efficiently and effectively. Highly Sought After Advice regarding practice valuations and transitions. Practice Operation Tips & Tricks to realize the full potential your practice. Access to all previous editions of the Bentson Copple reSource (over 40 editions). What are Industry Leaders Saying? The Bentson Copple reSource provides up-to-date information that guides your practice to profitability on a day-to-day basis. I depend on the Bentson Copple reSource for a clear view of the industry and meaningful management insights. Interesting contributors, useful and practical information, timely advice, sort of an all-in-one source. A great newsletter! I've found the Bentson Copple reSource an invaluable wealth of practice information. The reSource is my "go-to" guide for accurate and concise facts that guide my clients through numerous practice situations. I find the Bentson Copple reSource to be a great pulse on today's orthodontic community. The articles are informative, accurate and very timely. There are many informative, interesting and useful newsletters in our orthodontic community, but none better than the Bentson Copple reSource newsletter. As soon as I receive it, I read every article as my way of keeping up on trends in the industry and staying current with practice valuations and ortho residents' plans. Often the reSource is the first to identify the trends that others then follow and write about. The publication is definitely a leading edge resource! The reSource is particularly relevant in today's quickly changing environment. It is a "must read" newsletter for any orthodontist who is planning to retire, bring in a partner, is trying to grow his/her practice, or is a new graduate looking for an associateship or to buy-in. One of the TOP publications I subscribe to. Without question, Bentson Copple reSource is the best newsletter in the industry! I enjoy reading the Bentson Copple reSource because it keeps up with current trends around the country. It also provides what’s on the horizon for orthodontics. I appreciate having the Bentson Copple reSource to help me with my practice. 1) It is dedicated to orthodontists. 2) Provides current information on practice valuations and practice management. 3) Offers articles from different consultants on various timely topics. 4) Has insight into the way corporate dentistry is changing dentistry and orthodontics. 5) Updates on what orthodontic residents are thinking. 6) I like the fact it is quarterly (not too often). The Bentson Copple reSource is a great source of information on the topics that directly impact my orthodontic practice. The reSource addresses current issues while identifying future challenges and opportunities. The reSource has a finger on the pulse of my practice. 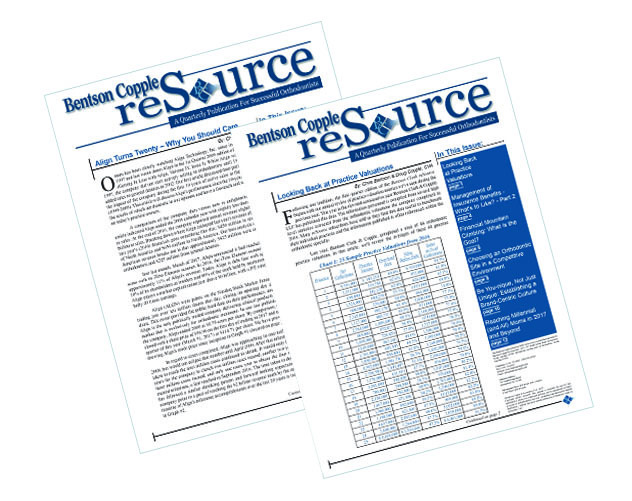 The Bentson Copple reSource is a great resource...the best available! Refund Policy: If you are not 100% satisfied with your purchase, within 60 days from the purchase date, we will fully refund the cost of your order.